Living with a chronic illness that is extremely debilitating in terms of energy and concentration has been arduous. Having to give up all my former social and physical activities was difficult but I've come to a stage of acceptance now that I can live with most days. The one creative activity that I refused to give up has been my knitting. Even when I felt so sick I couldn't get out of bed for days at a stretch, I kept my knitting beside my bed and would work a few stitches at a time, stopping when I felt too weak or dizzy. When it was just too much of an effort to pick up my needles, I would visualize my next design, planning the most delicious colors and softest texture to whet my knitterly appetite. At 4:00 am when sleep eluded me, I fantasized about creations concocted of luscious mohair and creamy cashmere, in shades of purply plum and brilliant turquoise. During this period most of my knitting projects were small - hats, scarves, bookmarks - since I found myself overwhelmed by larger items and the volume of stitches they required. I was at a very vulnerable stage in my illness when I decided that I would learn how to knit a sock. In retrospect, I can't believe that I subjected myself to this seemingly hopeless task while suffering from a severe inablity to concentrate for more than a few minutes at a time. I'm not sure why I was determined to learn this process, but I remember thinking I had to do this one thing in order to feel better about my situation. It was important to me that I learn something new. It felt like everything had been taken from me, my energy, quick wit, ability to reason, verbal skills, manual dexterity. Somehow I had to regain a sense of pride in learning a new skill and producing a finished item. My mom had tried to teach me sock knitting years earlier and we had ended up weeping with laughter, our hands intertwined in the yarn and needles as she tried to guide me through the steps. Now I was on my own, but I could hear my mother's voice inside my head, telling me that it was easy once you got the first few rounds completed. How can any sane human hold four small pointy sticks with two hands and somehow manipulate a fifth stick and a ball of yarn and expect to produce a wearable garment? I would feel the frustration boiling inside me as my patience wore down and my fingers fumbled over and over again with the needles. My hands became slippery with sweat as I concentrated, biting my tongue in the process. Suddenly, I noticed that I'd just moved over to the second needle without dropping or twisting any stitches. When I managed to complete several rounds without stabbing myself or having a stroke, I could have wept with sheer exhaustion and pride. Now I couldn't stop no matter how tired or ill I felt. I pushed myself to complete the top 10 rows of ribbing and lay back in bed, a huge grin spreading across my face as I contemplated the beginnings of my first sock. When I had become fairly competent at producing a wearable sock, I showed a friend how the process evolved, while the sock was still in the gusset decrease stage and spread over four needles. He was in awe, turning the half-finished sock over and studying the design. I suddenly realized that I had created something extraordinary. For weeks I kept waiting for someone to bestow a special commendation on me for my impressive needlework and would bore friends and relatives with minute details of my sock in progress. Finally, when the initial novelty had worn off, I was able to take this new proficiency in stride and I could almost hear my friends sighing with relief. Through many traumatic moments of this illness, I would pick up my knitting and escape inward, weaving the pieces of my broken life back together with the knit and purl stitches. When I was scheduled for a series of medical tests, I took my latest sock project along and knitted my fears and anxieties into the pattern. This is one pair of socks I will never part with. Months later, when my condition had stabilized and I had acquired some stamina, I was able to knit a vest for myself using all the blue shades in my yarn stash, changing colors midstream as I ran out of yarn or my interest waned. It turned out to be a size too small and the final result did not match my expectations, but it felt satisfying to complete something unique. Knitting has given me a link to the life that I inhabited before I became ill. Because of it, I've managed to retain my sense of self and feel creative in the process. Every project that I've completed during these past two years has given me more pleasure and joy than anything I created before. I'm also fussier about details and mistakes now. If this is all that I can bring into being at this moment, then it's going to be the very best. I've ripped out more projects than I've completed, but the effort has been worth the final results. I find that when I'm immersed in my knitting, I'm able to forget all the emotional and physical upheaval in my life and concentrate on knitting one beautiful stitch at a time. Nietchze's observation that "out of chaos comes a dancing star" is an accurate portrayal of my search for creative and spiritual expression in the midst of suffering. Knitting has helped me accomplish that objective. 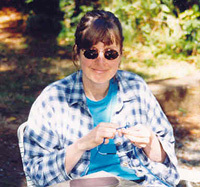 Mary Anne has been knitting intermittently since she was a teenager, but in the past two years, she's knit through all the trauma of a disabling illness. The soothing rhythm brings comfort to her painful days and sleepless nights. Knitting keeps her mind focused and her fingers flexible. Perfect medicine for the soul. © 2002 Mary Anne Mitchell. Contact Mary Anne.